It was with great sadness that we heard Dixon had died suddenly on 21st May 2008. He was well known and respected both in the Vermuyden LDWA, where he had been a member for 15 years, and the local community. This was reflected in the way Rossington Church was packed for his funeral. 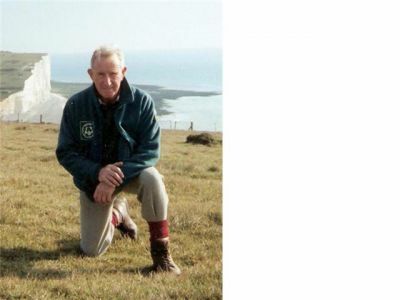 He was a very strong walker, and he completed the Durham Dales 100 in 1999, the Millennium 100 and the Lakeland 100 in 2002, which he was especially pleased with considering the very tough conditions. He also completed the London Marathon in 2001 in a very creditable time of 5:27:03. He had also completed the Cleveland Way and Yoredale Way. He was also a willing member of the Vermuyden Group checkpoints on various 100’s. As well as a keen walker, Dixon had always been interested in all kinds of sport. He was classy centre half and played football for Retford Town, as well as representing Carlisle when he was in the Army. He was also a horse racing enthusiast and went all over the country to race meetings with his friend the official race farrier. He loved dogs and horses, and while walking he would often stop to give a horse a mint, or make a fuss about a dog someone was out walking. Dixon was a kind man, always doing a favour for someone, walking someone’s dog, running an errand for a neighbour, or looking in on a sick friend, and always with a smile on his face. He was particularly proud of the fact that through his efforts, he had the local War Memorial moved to a more prominent place at the church, because he felt it should be more visible. A bit of a trailblazer, he took his wife Ruby on holiday to Switzerland in the early sixties, on his Heinkel scooter, which not knowing any foreign languages, was quite a brave thing to do. His health sadly deteriorated lately, and he suffered from cancer and heart problems, and died after having a heart attack in his garden, aged 74. He leaves a wife Ruby, to whom he was married for 52 years, a daughter Alison and son-in-law John. He will be badly missed, not only in the Vermuyden LDWA, but by the many people who had the privilege to know him.